St. Thomas Aquinas College will host its first Service Convocation on Tuesday, September 19, 2017, in the Romano Student Alumni Center, recognizing students and employees for exemplary service to the community. 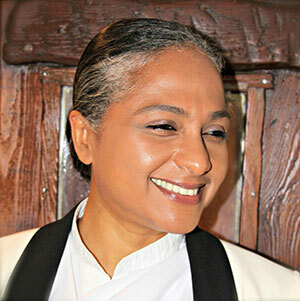 Sister Jenna Marajh, award-winning spiritual leader and founder of the Meditation Museum in Silver Spring (MD) and McLean (VA), will give the Service Convocation address and receive an honorary doctor of humane letters degree. Sister Jenna is an author, radio and TV personality, renowned speaker, and director of the Washington DC Branch of the Brahma Kumaris. She serves as one of the Evolutionary Leaders in service to conscious evolution and was selected by Empower a Billion Women 2020 as one of 100 Most Influential Leaders of 2015. Sister Jenna also served as a principal partner with the Oprah Winfrey Network and Values Partnerships on the Belief Team, a community of individuals from diverse spiritual, cultural and faith backgrounds. Sister Jenna has traveled to over 80 countries where she continues to provide practical life tools and solutions that empower people to foster and build stronger relationships. Her wisdom, peace, and compassion for humanity are expressed through the variety of initiatives she spearheads for youth, women, governments, and communities. She has collaborated with Fortune 500 companies on key issues and her syndicated radio show, America Meditating, is a popular global online show. Sister Jenna is the recipient of numerous awards and proclamations including, the President’s Lifetime National Community Service Award, Every Day Hero Award by the Foundation for A Better Life and the Friendship Archway Award, to name a few. Over 50 students will be recognized with distinctive service awards and five will receive Presidential Commendations. Elaine Winship (Washingtonville, NY), Instructor of Communication Arts, will receive the Faculty Service Award, and Robert Ambrose (Jamaica, NY), Maintenance Supervisor, will receive the Staff Service Award. Dr. Evan Matthews and Dr. Catherine Corcoran will perform a musical interlude during the ceremony. For more information about the Service Convocation and to view the live streaming of the event, visit http://www.stac.edu/service-convocation-2017. St. Thomas Aquinas College is an independent liberal arts college located on 60 acres in Rockland County, NY, which provides education at the undergraduate and graduate levels. The College’s 2,800 full and part-time students can choose from more than 100 different majors, minors, specializations, and dual degree programs across three Schools: Arts & Sciences, Business, and Education. The College is recognized by U.S. News & World Report in the Top-Tier for Regional Universities, by Colleges of Distinction in both its New York and Catholic editions, by Affordable Colleges Online as a top College in New York for Return on Investment, and is included as a Military Friendly School®. St. Thomas Aquinas College is accredited by the Middle States Association of Colleges and Schools; its School of Education is accredited by National Council for Accreditation of Teacher Education (NCATE); and its School of Business is accredited by the International Assembly for Collegiate Business Education (IACBE).